Joe Mondragon, a feisty hustler with a talent for trouble, slammed his battered pickup to a stop, tugged on his gumboots, and marched into the arid patch of ground. Carefully (and also illegally), he tapped into the main irrigation channel. And so began-though few knew it at the time-the Milagro beanfield war. But like everything else in the dirt-poor town of Milagro, it would be a patchwork war, fought more by tactical retreats than by battlefield victories. Gradually, the small farmers and sheepmen begin to rally to Joe's beanfield as the symbol of their lost rights and their lost lands. And downstate in the capital, the Anglo water barons and power brokers huddle in urgent conference, intent on destroying that symbol before it destroys their multimillion-dollar land-development schemes. The tale of Milagro's rising is wildly comic and lovingly tender, a vivid portrayal of a town that, half-stumbling and partly prodded, gropes its way toward its own stubborn salvation. 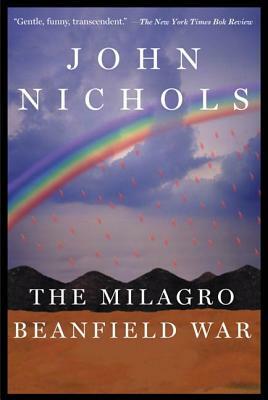 John Nichols's New Mexico Trilogy, inaugurated in 1974 with the publication of The Milagro Beanfield War, has grown from regional stature to national appeal, from literary radicals to cult classics. Beloved for his compassionate, richly comic vision and admired for his insight into the cancer that accompanies unbridled progress, Nichols is the author of novels and works of nonfiction. He lives in northern New Mexico.